I can prepare students for all voice examinations up to and including diploma standards for the Associated Board and Guildhall/Trinity Boards. These lessons will include work in aural/improvisation and sight-reading. 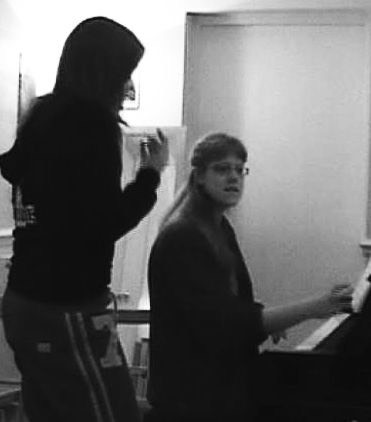 Lessons are on a one-to-one basis and are made up of technical work, repertoire (songs) and performance. 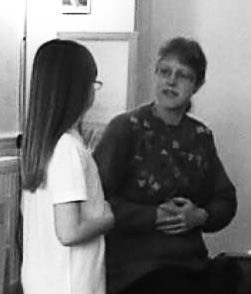 I teach Classical music (opera, operetta, song), Music Theatre, Jazz and Light Pop styles. Foreign languages taught are French, German, Italian, Russian and Latin. I am a firm believer in learning good vocal technique to unleash the creativity inside each and every unique singer and being focused and aware in the 'present moment' to gain the most from your learning and performing experience. I use lots of different teaching styles personally tailored to each student’s needs ...and wants! I also work on performance skills and understanding the text, style and meaning in songs based within their performance context. Click HERE to hear me sing. I have a fully equipped teaching studio with audio and video recording facilities. I operate SingAndSee spectrogram software and Audacity so you can see your voice in action. 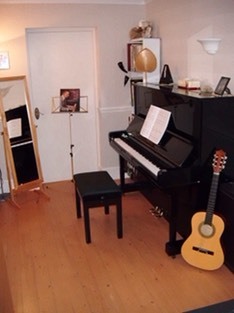 A transposing keyboard and normal piano are also available. I play the piano so you won't just be singing alone or you can sing to backing music. 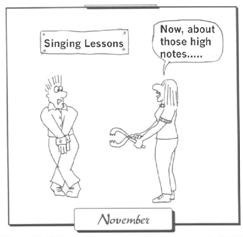 I am used to teaching singers of any age from those who are practically tone deaf with crippling nerves up to those doing University Final Degree recitals and teaching diplomas. Dyslexic? Autistic? No problems. All with learning difficulties are welcome too. With me you're in safe, experienced hands.